The 2016 Darrell Awards Jury started meeting in June and we had our 2nd meeting earlier tonight. From what I have seen so far, it looks like another good year of friendly banter and passionate discussions about the books and short stories that are nominated — and we already have several novels, short stories, Young Adult and Hall of Fame nominees in either ebook or printed forms to read. In particular, within the past week or so, we received two large packages of printed books from different authors — multiple books from each. So, every member of the Jury went home tonight with goodies to enjoy. We are now settling into our schedule of meetings and will be reading right up to the deadline. October 31, 2015 — if your work is not published by Halloween of this year, it can not be considered for the 2016 Darrell Awards or the 2016 Coger Hall of Fame. This is the publication deadline. Anything published after that will have to be held for 2017 consideration if it qualifies. January 1, 2016 — if your work is not nominated by 1-1-16, it can not be considered for the 2016 Darrell Awards or the 2016 Coger Hall of Fame. This is the nomination deadline. If your work is not nominated by this deadline, please see the Hall of Fame rules to see whether it qualifies for future consideration as such. 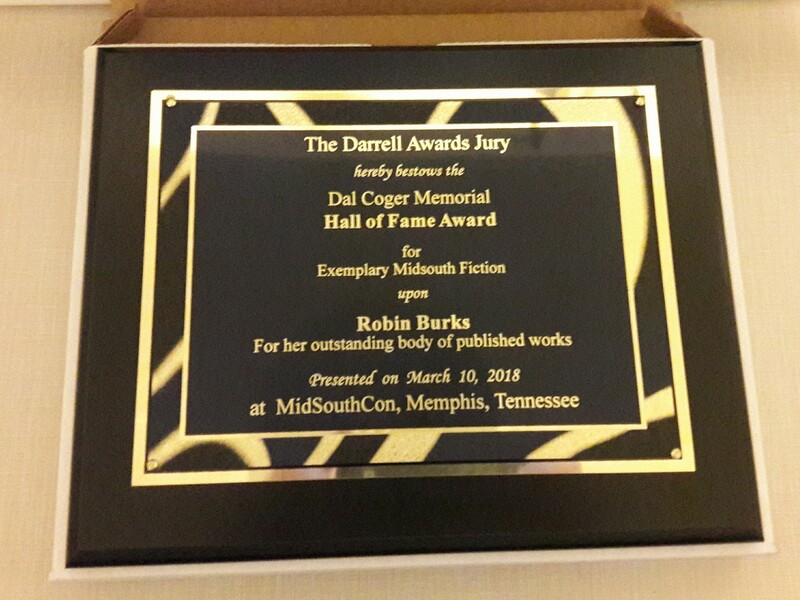 March 1, 2016 — the Jury’s deadline to turn in a list of Finalist to MidSouthCon. We will not release a list of those who have been merely nominated. We WILL release a list of Finalists and that list will appear here on this site as soon as possible after March 1st. Please see the 2016 Nomination Form here in order to nominate your work. 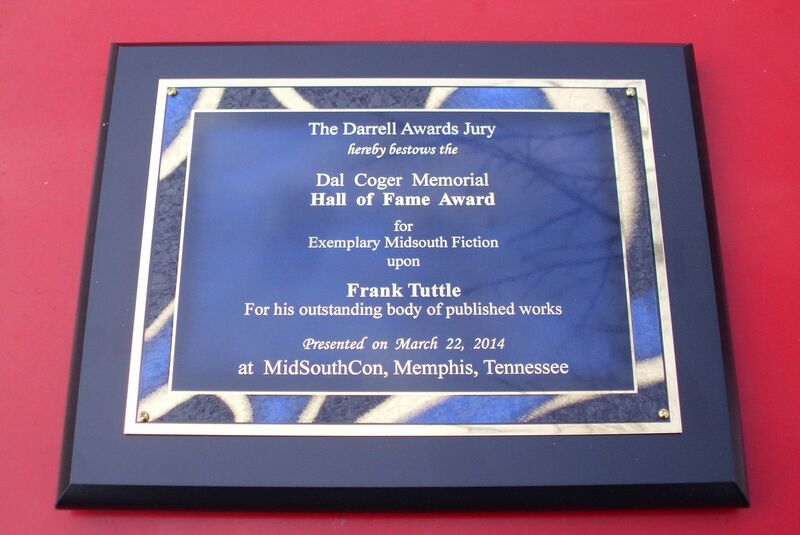 It gives us great pleasure to announce that the 2015 Darrell Awards were presented at the Banquet at MidSouthCon 33 on Saturday, March 21, 2015, and here are the results! As previously announced, Jeff Crook is the newest inductee into the Dal Coger Memorial Hall of Fame. DREAM THIEF # 4 by Jai Nitz is the Winner of the 2015 Darrell Award for Best Midsouth SF/F/H Other Media Work. This is the first time that a comic book has won a Darrell Award (in this or any other category). Previous Other Media winners included films, plays and efiction (before the Jury started considering efiction as just fiction). Barry (a short film available on vimeo.com) by Matthew Graves is the First Runner Up for the 2015 Darrell Award for Best Midsouth SF/F/H Other Media Work. The Five Faces (a Markhat novel) by Frank Tuttle won the 2015 Darrell Award for Best Midsouth SF/F/H Novel, with Valkyrie’s Daughter by John E. Siers as First Runner Up in the novel category. Eat Your Peas by Robert J. Krog won the 2015 Darrell Award for Best Midsouth SF/F/H Short Story. This story appeared in Luna’s Children: Full Moon Mayhem. Stolen Thunder by H. David Blalock (seen in Realms of Imagination) is the 2015 First Runner Up in the short story category. The Serpent and the Dagger by Robert J. Krog (seen in A Tall Ship, a Star, and Plunder). As we have done in some previous years, the Jury chose not to award in the Novella category this time. Each of the Finalists were invited to attend MidSouthCon 33 on Saturday, March 21, to participate in a Meet the Darrell Awards Finalists Panel and offered a free ticket to the Banquet later that same day. Jai Nitz , Robert J. Krog and Jeff Crook were unable to attend; they each sent remarks, which were read at the Banquet. We were unable to contact Matthew Graves. The other Finalists responded and attended the 2015 Darrell Awards presentation. Photos of the Plaques presented to the Winners will be posted on the Darrell Awards page on Facebook and other social media sites. The Darrell Awards are given annually to support literacy in the greater Memphis area (the Midsouth) by recognizing the best published Science Fiction, Fantasy and/or Horror fiction. Annual categories include Novel, Novella, and Short Story. Other Media and Young Adult alternate on a 2 year cycle; this year we considered Other Media, which includes plays, audio presentations, podcasts, movies, games, comics, and other non-book and non-ebook forms of SF/F/H. In 2016, we will consider Young Adult SF/F/H. Please check back here for an announcement when the nominations for the 2016 Darrell Awards are opened. We heartily recommend these Winners and Finalists to all those who enjoy a good story, especially to fans of Science Fiction, Fantasy and/or Horror. Now, GO BUY THEIR BOOKS AND READ THEM !